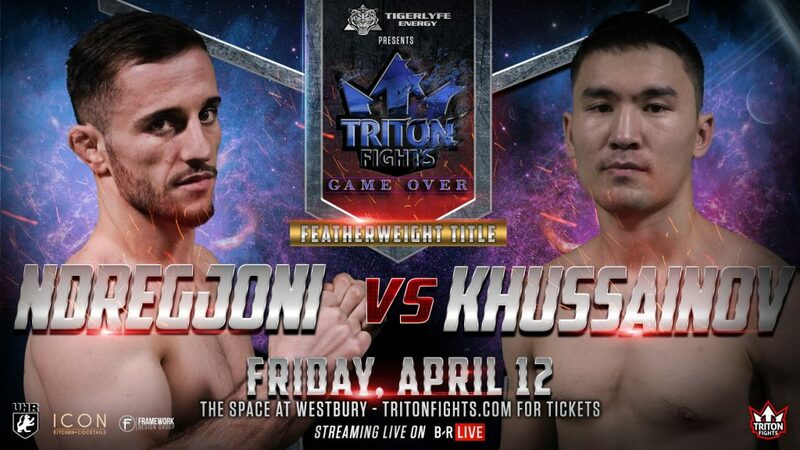 Tonight, at the Space in westbury, Long Island, New York, Triton Fights 12 hosts another stacked fight card, which includes 13-bouts. The fights will be streamed live on Bleacher Report starting at 8 PM est. Visit TritonFights.com for more information about this live event! Two titles are up for grabs tonight. The Triton Fights Featherweight title and the Triton Fights Middleweight title. 145- Vilson Ndregjoni (2-1) def. Zhassulan Khussainov (2-1) via guillotine Round 1, at 1:57. 185- Ryan Charlebois (6-0) def. Kareem Kline (4-3) via Unanimous Decision (30-27, 30-27, 30-27). 170- Nick Olsen (4-5) def. Ibrahim Kallie (3-3) via TKO in Round 2, at 1:39. 155- Andrew Stock (6-2) def. Tim Ring (4-3) via Submission (Arm bar) in Round 1, at 2:45. 170- Alex Brown (4-2) def. Rene Pereyra (3-2) via Submission ( guillotine) in Round 1, at 2:46. 175- Jason Downer (2-0) def. Pernell Rachel (1-1) via TKO in Round 1, 1:50. 150- Estevinson Carmona (3-0) def. Dennis Stamp (0-4) via TKO in Round 2, at 2:59. 125- Orlando Ortega (2-1) def. Sergio Rivera (0-3) via Unanimous Decision (29-28, 29-28, 29-28). 105- Rebecca Bryggman (2-0) def. Alayna DeFranco (1-1) via Unanimous Decision (30-27, 30-27, 30-26). 185- Rob Rinck (2-0) def. Mike Basil’s (0-2) via Unanimous Decision (29-28, 29-28, 29-27). 135- Felipe Lopes (1-0) def. David Garcia (0-0) via Submission (Rear-Naked Choke) in Round 1, at 1:51. 170- Dale Menendez (1-1,1 NC) def. Al Pringle (1-7) via TKO (due to strikes) in Round 2, at 0:32. 190- . Christian Alcala (4-3) def. Issac Poteat (1-3) via Unanimous Decision (30-27, 30-27, 30-27).